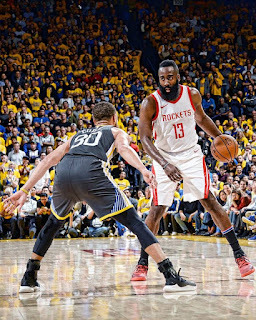 The Houston Rockets have retaken home court advantage by doing the seemingly impossible and winning a playoff game on the Golden State Warriors' home court. The series now stands at 2-2, with the Houston Rockets taking the series back to the Toyota Center for games five and potentially seven. Against the vast majority of expectations, James Harden, Chris Paul and the Houston Rockets have made this into a series with one of the most exciting games of the playoffs this season. If you're the Rockets or a fan thereof, there's no way not to be overjoyed with this game. This was a performance in which the pressure was at its greatest, in which the entire season was on the line. The difference between being tied with home court advantage and being down 3-1 may be only 2 games by the math, but is immeasurable emotionally. This is not a desperation series with the Rockets playing in three elimination games. This is a real series, one in which the Rockets have reason to believe they can win. The game itself beggared belief. After starting the game in a staggering 0-12 hole, the James Harden turned on the afterburners and led the team to lead by 7 at halftime. The Warriors then went supernova briefly, putting the Rockets back in a 12 point hole. Despite trailing by 10 to start the fourth quarter, the Rockets would not be deterred and turned in their greatest defensive quarter of the series if not the season. The Warriors slowed down and were harried into poor shot after poor shot, scoring an ice-cold 12 points in the final frame. This was all the Rockets needed to take this game home, and to take the series back to Houston. James Harden showed the world why he's a mortal lock to have won MVP this season. His 30 points on 26 shots were good, as were his 4 rebounds and 4 assists. More important were his defensive stats, including 3 steals and 2 blocks, all of which were alarming and magnificent. Harden was locked in defensively, particularly in the fourth quarter, and was able to put a couple nails in the coffin on that end. He doesn't seem willing or able to maintain this level of defense for an entire series, but sometimes he'll show the world what he can do. Chris Paul, much maligned after the last game, shot 5-9 from deep on his way to 27 points, each one absolutely required. He was able to operate in isolation and, as the game progressed, find a few incredible looks for teammates. He's clearly operating on one and a half feet, but was able to survive to fight another game tonight. Time and again, Paul justifies his role with the team, and is now one step closer to yet another round in the playoffs he's never been to: The NBA Finals. This was the greatest victory in twenty years for the Houston Rockets. This was a knock-down, drag-out fight that Harden, Paul, Capela, Tucker, Ariza and, yes, Gordon all slogged their way through to get a massive win. There will be plenty of time for doubt and recrimination eventually. There always is. But tonight, there is only room for victory.